I love these stories. Thank you so very much. The product that changed our life was The Puller. The purple rings I'm always raving about. It made it easier for us to keep the dogs attention and exercise with them at home. This weekend, we tracked down the 10th puller that's been missing for a while. Scout got so excited trying to choose a ring out of a pile - I wish I had a camera. Glad that these products are working for your girls. The fireworks are ridiculous and I hate them. They weren't so bad this year, but they've been crappy in years past. This year, our dogs barely noticed which is such a huge difference. I can see how much fun your dogs would have with the Puller with the space you have for them to run and chase it! The Ginger Sisters like it, too, and I really love the material, although I have to keep them away from Boca as she will chew them to bits. It's amazing how one product can make all the difference! Omg! 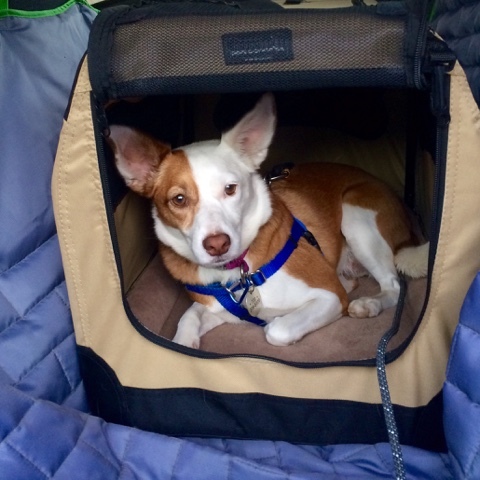 I recently bought the same crate for our dogs in the car (I love how easy it is to use too!). My reasoning was that the car is technically not mine and I wanted to keep the dogs from filthying up the seats BUT when I took Brodie on a drive yesterday I found myself wondering why on EARTH I hadn't thought of it sooner. He didn't once react to joggers or dogs that we passed because I don't think he really saw them. Game changer. My Kizzie isn't bothered by storms and is a good little girl in the car. However... my Koko suffers from both of those maladies - fear of thunder and he is insane when we go for car rides -- reacts exactly like your Ruby does (did). He has a thundershirt - which helps a bit for storms, but he still gets a little anxious. I keep meaning to try it on him for car rides and keep forgetting. However after hearing your success story with the crate (and it is something our trainer has suggested as well) I definitely need to get one for him. Thank you for the link! I put it off far too long and it has really opened up more possibilities for us. I hope it works for you, too! Our life changing products? Hmm. Probably a comfy back clip harness and a 20 ft long line. We had stopped hiking for a few months because every time we did, the humans got frustrated by stopping every few feet and Nala practiced behavior that undid any meager progress we were making on loose leash walking. With the long line, Nala gets to explore more freely so she acclimates more quickly, and the humans have more fun, too--all of which means we go hiking more often, which is awesome. We're even beginning to feel like we could trust Nala off leash--which would, of course, be another game changer. Now that we are more mobile, I hope to take the girls hiking this summer and fall. I have a long-line for Ruby as well, and know she would love the extra freedom on a hike. I am really glad the thundershirt is helping Boca! Noise phobias are so sad! So happy for you to have hit on some good solutions for the ginger sisters! Great solutions! 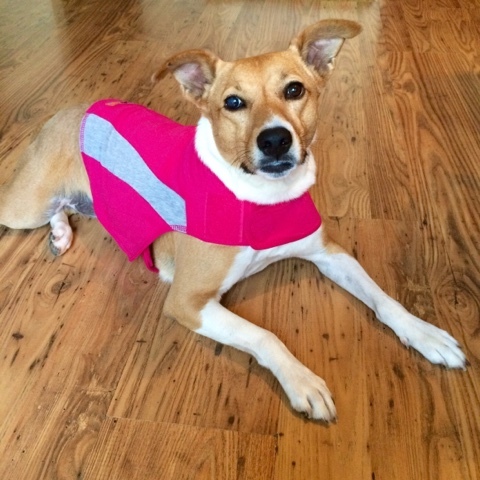 A Thundershirt was very helpful to Shyla in coping with her other non-noise-related fears. She used to wear it to town every time we went, and it helped a lot. I'm glad that Boca loves hers! So glad you found some solutions! I wished the ThunderShirt worked for Pike. It helps with Nola's mild separation anxiety (which only happens if we're away from home), but of course it doesn't work for the dog that needs it! I have been recently thinking of getting a crate for car travel as well. My dog sits well in the car, but I get nervous about longer trips especially on highways. Just wondering what size crate did you get for Ruby? Ruby's travel crate is 24" x 16" x 16". She weighs 18lbs and is about 13" tall. Thanks for stopping by and I hope you find a travel crate that works well for you!